We carefully choose our suppliers and hold them accountable for their actions in order to support our efforts to reduce the environmental and social impacts of apparel and footwear products worldwide. We expect our suppliers and national brand partners to follow our Vendor & Supplier Code of Conduct. Macy’s manages its private label brands through an internal division known as Macy’s Merchandising Group (MMG), which monitors suppliers’ facilities. Since 1995, Macy’s, Inc. has required its Macy’s private label suppliers to comply with its Vendor & Supplier Code of Conduct which sets clear, stringent standards and requirements for all suppliers doing business with Macy’s, Inc. private label businesses. The Code requires compliance with child, forced labor, wage and hour, and unsafe working condition standards. In every case, new suppliers must meet or exceed our minimum standards before being approved for production and added to our merchandise ordering system. To ensure compliance, MMG uses an independent third party to conduct unannounced social compliance audits at all factories producing private label goods. A comprehensive audit protocol covers all Code principles and local country laws related to working hours, wages and benefits, health and safety, harassment and abuse, discrimination, subcontracting, environment, freedom of association, child labor, and forced labor. With few exceptions, we require that all factories are subject to annual social compliance audits. More frequent audits occur at factories where corrective actions have been required. If high-risk violations are found, immediate action is taken to investigate and remediate, and the supplier and/or factory relationship may be terminated. The company also conducts security audits of its Free On Board overseas factories for private brand production in cooperation with U.S. Customs and Border Protection, as part of the Customs-Trade Partnership Against Terrorism (C-TPAT) program, of which Macy’s has been a member since the program was introduced in 2002. The goal of C-TPAT audits is to continuously improve security measures at our production sites and throughout the supply chain. In fiscal 2017, the company conducted 865 factory audits. Eleven factories fell under the High Risk category. Of those, 10 were terminated and are no longer used for production. One factory was allowed to remain active pending remediation, follow-up audits and specialized training. All Macy’s Merchandising Group (MMG) suppliers are trained on Macy’s Code, audit protocols and terms of engagement. The social compliance team continuously communicates expectations, encourages robust internal compliance policies, and partners with suppliers on continuous improvement at manufacturing facilities. Internally, the team trains product development professionals on Code of Conduct standards, high risk violations such as child and forced labor, human trafficking, and illegal subcontracting, and MMG engagement with industry initiatives. The Macy’s, Inc. policy regarding the use of conflict minerals in our private label products covers Macy’s, Bloomingdale’s, Bluemercury and their respective subsidiaries. Macy’s uses a third-party service provider to assist with an annual conflict minerals surveys to Tier-1 private label suppliers for Macy’s, Bloomingdale’s and Bluemercury to identify smelters and refiners in the supply chain. Macy’s requires Tier-1 suppliers to source metal trim components from a conflict-free nominated trim supplier list, and nominated trim suppliers are required to participate in the annual survey. See macysinc.com/social-responsibility for the most recent Conflict Minerals Report for Macy’s, Inc.
MMG has expanded the scope and requirements of its Nominated Trim Supplier program. The program includes all zippers, all children’s press fasteners, and all other metal trim components for apparel, accessories, footwear, home textiles and plush (not including labels/ packaging material). All Nominated Trim Suppliers included in this program are required to provide MMG the appropriate documentation to help substantiate compliance U.S. regulatory requirements at both the state and federal level. If a trim supplier is not able to meet or maintain these expectations, it risks being removed from the program. 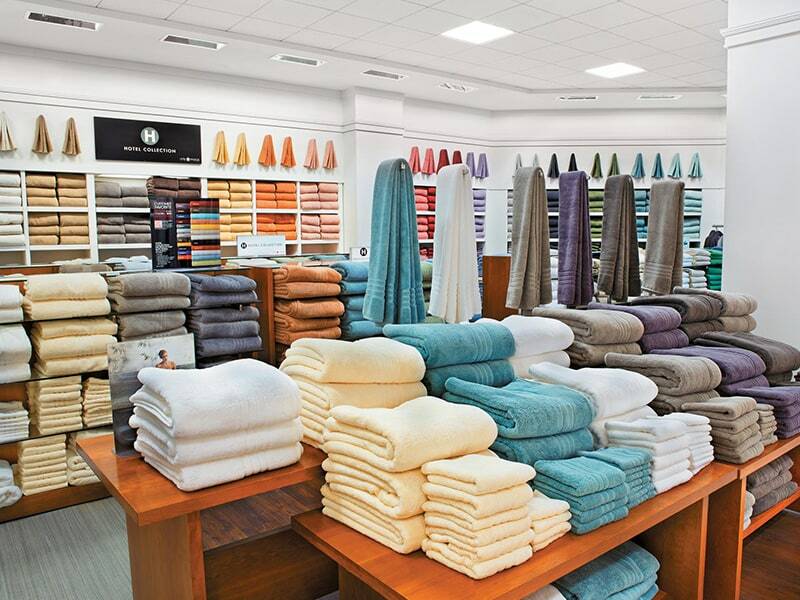 Macy’s goal is to provide the best service, selection, quality and value to its customers. To help support this philosophy, and to protect the integrity of its private label brands, MMG has built safety and quality into our development process and established comprehensive testing and inspection programs. These programs incorporate regulatory, safety and quality standards, as well as protocols for all private label products. MMG also inspects product at various stages of production and after-production in our stores to ensure compliance with our specifications. Helped to form Worker Safety Committees in almost 200 factories. In 2019, the Alliance is transitioning into a new initiative to verify that factories in Bangladesh: (1) continue to meet the National Action Plan harmonized standards for physical safety (structural, fire, and electrical), (2) have implemented standardized training programs focused on worker safety, and (3) continue to make the helpline service available to their factory workers. MMG is a member of the Sustainable Apparel Coalition (SAC), a trade organization working to reduce the environmental and social impact of apparel and footwear products around the world. SAC comprises brands, retailers, manufacturers, government, non-governmental organizations and academic experts representing more than one-third of the global apparel and footwear market. In 2018, MMG rolled out the SAC’s Higg Index of sustainability to 270 factories and 150 other facilities in that supply chain. The Index is a suite of self-assessment tools that empowers brands, retailers and facilities to measure their environmental, social and labor impact and identify areas of improvement. In 2017, MMG became a member of the Leather Working Group, an independent organization that assesses the environmental compliance and performance capabilities of tanneries, and promotes sustainable business practices within the leather industry. LWG certification is awarded to tanneries that demonstrate environmental best practices and performance in all areas of leather production, from chemical and water management to energy use, greenhouse gas emissions, waste management and hide traceability. MMG requires that all tanning facilities providing leather for private label goods be LWG certified by 2021. More information can be found at www.leatherworkinggroup.com. Macy’s, Inc., requires all of our suppliers to comply with the applicable laws and regulations of the United States, and those of the respective country of manufacture or exportation. In accordance with the California Transparency Supply Chains Act (SB 657), Macy’s and Bloomingdale’s take steps to address human trafficking and slavery in the direct supply chain, which include both private and national brands. In addition to the efforts described, the company maintains an open dialogue with non-governmental organizations and socially responsible investor groups regarding developments in this arena. Macy’s and Bloomingdale’s supply and legal executives meet on an annual basis, and informally as needed, to assess the risk of human trafficking and slavery in our supply chains and to assess whether our policies and procedures appropriately address those risks. At Macy’s, independent third party monitors conduct annual compliance audits of our private brand suppliers to identify possible areas of non-compliance with our Vendor and Supplier Code of Conduct or potential risks in Macy’s private brands supply chain. Macy’s will not tolerate, and will investigate, any reports alleging human trafficking and slavery in the supply chain. Action is taken against any supplier for non-compliance, resulting in possible termination of the business relationship. Macy’s does not conduct audits of our national brand suppliers, but they are contractually obligated to conduct the same level of due diligence. At Bloomingdale’s, independent third-party monitors also conduct annual compliance audits of certain private brand suppliers under the same process outlined above. Bloomingdale’s contractually holds our national brand suppliers and certain other private brand suppliers, who supply the vast majority of the products we offer for sale, to the same level of due diligence. Bloomingdale’s will not tolerate, and will investigate, any reports alleging human trafficking and slavery in the supply chain. Action is taken against any supplier for non-compliance, resulting in possible termination of the business relationship. All Macy’s and Bloomingdale’s suppliers must adhere to our Vendor Code, which includes language strictly prohibiting human trafficking and slavery. 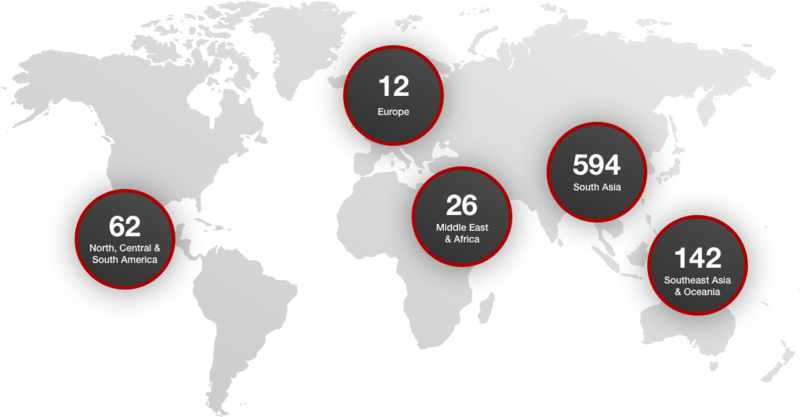 The Vendor Code incorporates local laws and is based on international standards, such as International Labor Organization and United Nations regulations. The Vendor Code states that all suppliers must also comply with the country of manufacture’s labor laws, whichever is stricter. Macy’s and Bloomingdale’s also include requirements of adherence to the Vendor Code in our Vendor Standards and Purchase Order Terms and Conditions, and we send periodic communications to suppliers to make them aware of new laws or revisions to existing laws as appropriate. By accepting each and every purchase order, Macy’s and Bloomingdale’s suppliers confirm their understanding and agreement to the standards set forth in the Vendor Code. Macy’s and Bloomingdale’s associates adhere to an employee Code of Conduct that informs them about the requirements of the Vendor Code of Conduct relating to human trafficking. The issue of human trafficking is addressed annually in Code of Conduct or General Legal Compliance training. In each of the last three years, more than 25,000 Macy’s, Inc. employees have received this training. Employees responsible for supply chain-related decisions for private brands at Macy’s and certain private brands at Bloomingdale’s receive more detailed training on identifying and addressing human trafficking and slavery in our supply chain. 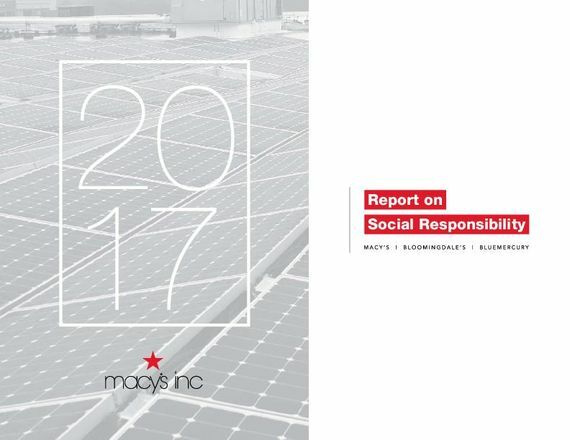 At Macy’s, Inc., we have a number of exclusive ongoing merchandising initiatives involving socially responsible products. Macy’s has partnered with OEKO-TEX® to supply select private label products certified with the STANDARD 100 or MADE IN GREEN by OEKO-TEX ® labels. STANDARD 100 by OEKO-TEX® certification ensures the item has been tested against a list of more than 300 harmful substances. MADE IN GREEN by OEKO-TEX® certification identifies products made from materials tested for harmful substances, manufactured using environmentally friendly processes, and made in factories under safe and socially responsible working conditions. These products are available in Macy’s stores and online at macys.com. In 2017, bloomingdales.com introduced the Sustainable & Mindful Shop, a curated assortment of merchandise with recycled, charitable or sustainable attributes. Customers are able to shop products from dozens of vendors such as TOMS shoes, Eileen Fisher apparel and S’Well water bottles.